2014-15 AKPer Hannah Horner (Whitman College) visited the Kyoto Office! She is working on her doctorate at the Rensselaer Polytechnic Institute in New York. 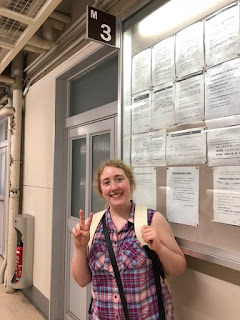 This summer, she was able to secure grant money to do a math research project at Tohoku University. After eating a nostalgic lunch at Doshisha’s Meitokukan cafeteria, she posed for a photo in front of her old Japanese classroom.